More than 320 students and staff at King Street Intermediate School in Danbury, Connecticut, recently fingerprinted themselves to begin a collaboratively produced art installation for The Aldrich Contemporary Art Museum in Ridgefield, Connecticut. Artist Sandy Garnett is working with KSI students and their art teacher, Doreen Cherniske Colonna, to incorporate an individual fingerprint contribution from each student and staff member into a final piece. Garnett, who is based in Norwalk, Connecticut, has been producing fingerprint-based artwork himself for more than 20 years. Through his Fingerprint Project, he explores contemporary identity through sculpted and painted fingerprints, human silhouettes and signatures. "The Fingerprint Project is one of the cornerstones of my professional fine art career," Garnett says. "I have collected thousands of fingerprints from which I have made hundreds of fine art objects during the past several decades. I have always been interested in a large group Fingerprint Portrait installation, so the project at King Street Intermediate School has been an exciting project for me." 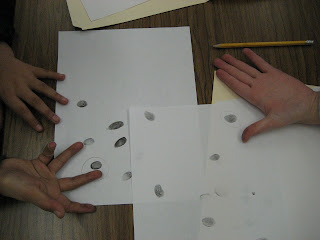 Earlier this month, Garnett went to the school and led several groups of 60 to 150 students in creating their own inked fingerprints on paper. Next, Colonna will enlarge each student's favorite print into an abstract image, which the students will then transfer onto small pieces of Plexiglas. Garnett will combine these more than 300 pieces into a single installation, which The Aldrich will exhibit in early April as part of its DrawOn! project. The purpose of DrawOn! is "to bring people together through something as basic as drawing, while at the same time fostering new and imaginative ways to draw." The public is encouraged to participate in DrawOn! events scheduled throughout Connecticut and beyond, from March 27 to April 10, with a culminating family event on April 10. For more information, visit www.aldrichart.org/events. "I love the collaborative aspect of this project," says Colonna. "Between the kids, the professional artist and the museum. I also love that EVERY student is included. It is a true 'fingerprint' of our school." This is the second year in a row that Colonna has been invited to exhibit her KSI students' artwork as part of DrawOn! at The Aldrich. Last year, students not only created works on various shapes of cardboard -- thinking beyond the usual rectangle "box" they often draw on -- they also drew on two teachers who wore full-body white Tyvek suits. "This project has been fun because I never did anything like this in my life," said one KSI student while working with Garnett earlier this month. A student last year said, "I liked DrawOn! the most because it made me think you can make art on anything." Garnett is a self-taught, multidisciplinary artist who has sold more than $1.8 million of artwork. He also writes, illustrates, sings and records. His children's books have recently been published, and an independent film producer put Garnett's first written and recorded song, "Busted Wing," in a film about climate change. "It is important to have visiting artists like Sandy," says Colonna. "The kids get to see someone who went through school and came out the other end still doing what they feel passionate about -- and making a living at it. "It is also important for those kids who have tremendous talents in areas that are not always as highly valued in education nor reflected in standard test areas. These students see that their talents are not a waste, that they can use those talents, and that they should not give up or let anyone take those talents away from them." DrawOn! is a community-based project of The Aldrich, which encourages everyone -- not just artists -- to engage in drawing. On anything. With anything. This practice is not so much about drawing a "perfect piece," or about the final product, but about the creative process itself. It is also about the community building that happens when people draw and create together. It is a fun and playful activity that can help people rediscover their creative talents. The King Street Intermediate School Fingerprint Project for DrawOn! is also part of an on-going initiative to integrate more creativity into the classroom at KSI. The staff is working with Steven Dahlberg, head of the International Centre for Creativity and Imagination, to help teachers both teach for more creativity and teach more creatively. "The Fingerprint Project is great example of how creativity engages both students and staff in meaningful work," says Dahlberg. "Students were invited to create something unique and original and will have the rare opportunity to see their creative expressions displayed publicly in a major art institution. This is inspiring, not only to the students, but to their teachers and parents and the community, as well." The public can hear more about this project and DrawOn! and meet Garnett, Colonna and Dahlberg at Creativity Networking at The Silo at Hunt Hill Farm in New Milford, Connecticut, from 2 to 3:30 p.m., Sunday, March 14. Find out more at http://www.appliedimagination.org/.